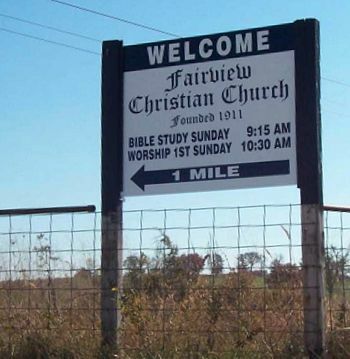 Difference between revisions of "236.16 Outdoor Advertising"
MoDOT is responsible for regulating outdoor advertising adjacent to the Interstate System, National Highway System (NHS) and highways classified as Federal Aid Primary as of June 1, 1991 (FAP-1991). (Refer to the [https://www.modot.org/sites/default/files/documents/ODA_Billboard_wAreas9272018.pdf map], [https://www.modot.org/billboard-controlled-travelway-map-county county map] or [https://www.modot.org/sites/default/files/documents/BillboardControlledRoutes.pdf description]). 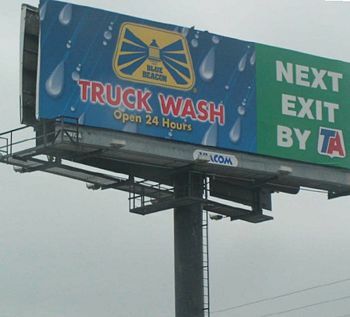 MoDOT is responsible for regulating outdoor advertising adjacent to the Interstate System, National Highway System (NHS) and highways classified as Federal Aid Primary as of June 1, 1991 (FAP-1991). (Refer to the [https://www.modot.org/sites/default/files/documents/ODA_Billboard_wAreas9272018%20%282%29.pdf map], [https://www.modot.org/billboard-controlled-travelway-map-county county map] or [https://www.modot.org/sites/default/files/documents/BillboardControlledRoutes.pdf description]). On October 1, 2012, the federal transportation reauthorization act, [http://www.fhwa.dot.gov/map21/ Moving Ahead for Progress in the 21<sup>st</sup> Century (MAP 21)] became effective, modifying the routes that are classified as part of the enhanced NHS. 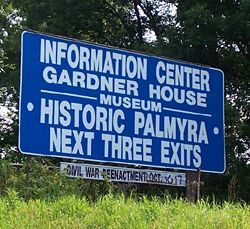 Off-premises signs located along these routes prior to October 1, 2012, were grandfathered and required to obtain an outdoor advertising permit from MoDOT (see [[#236.16.10.1 Adding Controlled Routes|EPG 236.16.10.1 Adding Controlled Routes]]). After October 1, 2012, off-premises advertising along these routes shall meet current permit requirements and obtain a permit from MoDOT prior to erection (see [[#236.16.5 Permitting Outdoor Advertising|EPG 236.16.5 Permitting Outdoor Advertising]]). MoDOT is responsible for regulating outdoor advertising adjacent to [https://www.modot.org/sites/default/files/documents/ODA_Billboard_wAreas9272018.pdf controlled routes]. Off-premises signs located along these routes are required to obtain and maintain an outdoor advertising permit from MoDOT. On-premises signs are not required to meet the permit requirements or obtain a permit from MoDOT. Types of outdoor advertising include Billboard, Directional, Service Club & Religious Notices, Official, Public Service, and Public Utility. 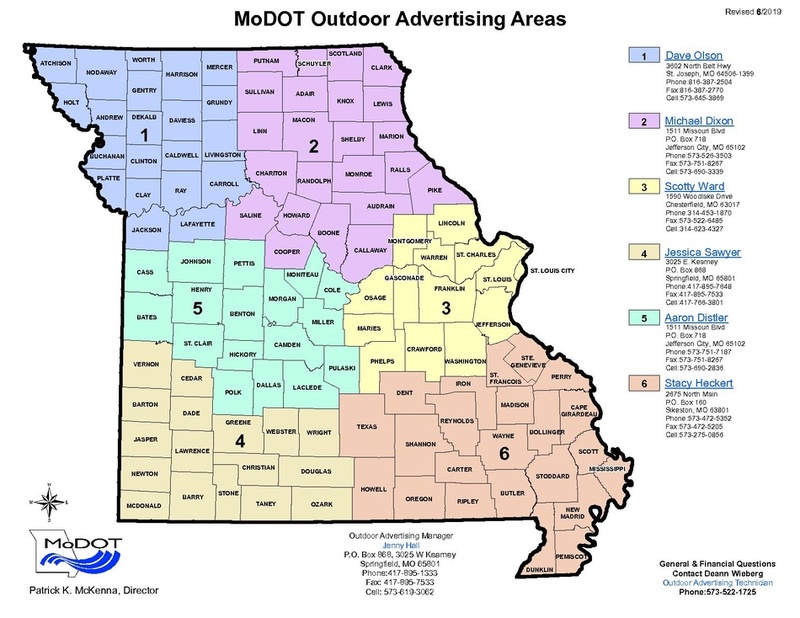 MoDOT is responsible for regulating outdoor advertising adjacent to [https://www.modot.org/sites/default/files/documents/ODA_Billboard_wAreas9272018%20%282%29.pdf controlled routes]. Off-premises signs located along these routes are required to obtain and maintain an outdoor advertising permit from MoDOT. On-premises signs are not required to meet the permit requirements or obtain a permit from MoDOT. Types of outdoor advertising include Billboard, Directional, Service Club & Religious Notices, Official, Public Service, and Public Utility. Upon receipt of a digital upgrade request, the area specialist should inspect the sign prior to sending the Digital Upgrade Approval or Digital Upgrade Denial Letter. If the vegetation application and inspection meet all the requirements as outlined in RSMo Section 226.585, 7 CSR 10-6.085 and EPG 236.16.15 Vegetation Removal, a vegetation permit should be issued. A vegetation site inspection should be entered and the vegetation permit status shall be changed to “ACCEPTED” with reason “COMPLIANT” with the Vegetation Permit and Vegetation Permit Cover generated. The cover letter and permit should be sent to the permit owner. Additionally, the permit should be sent to the appropriate roadside manager and maintenance supervisor. The application and supporting documentation should be maintained until the vegetation permit is released or voided. All permitted outdoor advertising should be measured and located by Global Positioning System (GPS) coordinates coordinates within sixty (60) days of the complete inspection. Keeping safety as a priority, area specialists should work in teams to collect this data. Each team is assigned a set of equipment which includes a Trimble, camera and laser.